The La Mesa Chamber of Commerce and Barnes & Noble at Grossmont Center invite the public to purchase a book to donate to the Chamber’s annual “La Mesa Military Families Holiday Project.” The books may be purchased at Barnes & Noble at Grossmont Center from Sep. 29 through Oct. 27. La Mesa Chamber of Commerce’s Military Families Holiday Project gathers new toys, diapers and other items for military families that are living in the two military housing locations in La Mesa, and family members deployed during the holidays. This event is called “Stuff the Jeep” and there will be a Jeep — on loan from La Mesa’s Carl Burger Dodge Chrysler Jeep RAM World — in Grossmont Center beginning Oct. 22. 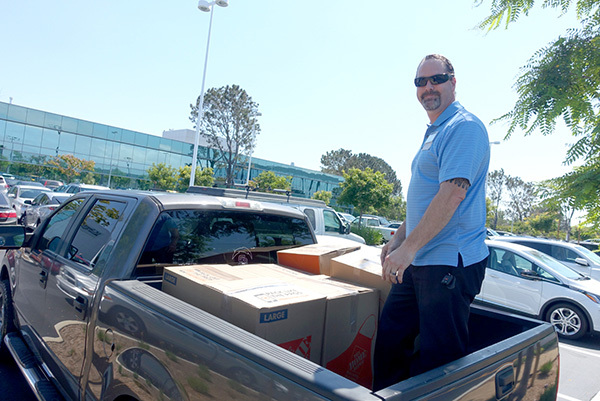 On Oct. 27 at 3:30 p.m., all of the books that have been donated will be brought out and “stuffed” in the Jeep and handed off to the La Mesa Chamber to be included in the Chamber’s annual military children and families holiday enhancement project. To participate, visit Barnes & Noble in Grossmont Center and pick a book from the stack of books available to donate to the military families. All those that donate a book will be given a raffle ticket. Raffles will be held for prizes on Oct. 27, noon–4 p.m. In addition to the raffle, there will be children’s activities such as crafts, special story time and more. The day’s raffle prizes are being donated by Barnes & Noble, Carl Burger Dodge Chrysler Jeep RAM World, Grossmont Center and the La Mesa Chamber of Commerce. For more information about this project, visit lamesachamber.com. On Sept. 26, the Grossmont Union High School District (GUHSD) and Erickson-Hall Construction Company (EHCC) held a contractor outreach event that brought together the GUHSD’s construction management team and local general contractors, subcontractors, and small and/or historically underutilized businesses looking for opportunities on the upcoming construction of the new Event Center at Grossmont High School. The $19.9 million project is funded through Proposition U, approved by East County voters in November 2008, and Measure BB, approved in November 2016. The GUHSD team discussed the new project, project schedule, pre-qualification process, bonding, insurance, and other forthcoming projects and staff helped contractors register to bid for contracts. There will be approximately 18 bid packages associated with the project, expected to be advertised in mid-October 2018. The project site is roughly 105,000 square feet with extensive new concrete paving, retaining walls, landscaping and asphalt paving. The project is all new construction that includes modern technology for audio, video and lighting systems. Virtually all construction trades will be required to complete the project. GUHSD had announced that it is especially interested in engaging local contractors and those with certifications as a small, disadvantaged, woman-owned, minority-owned, or disabled veteran-owned business enterprise. A 9,985-square-foot auditorium with seating for 475. A 7,450-square-foot wing with dance classroom, locker rooms, and a scene shop. A 8,235-square-foot “black box” drama classroom and green rooms, a digital music classroom, and a choral classroom. On Sept. 6, Voya Financial, Inc. — a provider of workplace retirement solutions, including savings plans for K-12 educators — awarded Julia Cole, a teacher at La Mesa’s Murray Manor Elementary School, a $2,000 grant as part of the company’s 2018 Voya Unsung Heroes awards competition. Through the Voya Unsung Heroes program, Voya Financial awards grants to K-12 educators nationwide to honor their innovative teaching methods, creative educational projects, and ability to positively influence their students. For more than 20 years, the program has awarded over $5 million in grants to more than 2,000 educators across the United States. 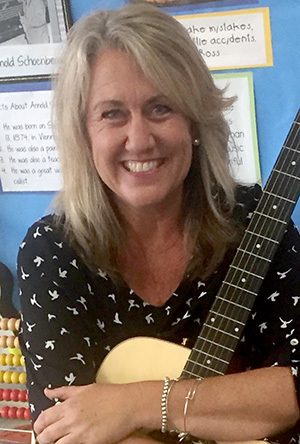 Cole’s innovative teaching idea, “Literacy Through Music,” focuses on involving young students physically by providing them with musical instruments to expand their knowledge, learning and memory skills. With the Voya grant, Cole will be able to purchase the necessary tools to distribute equally among all grade levels at Murray Manor Elementary as well as provide teacher training for the program. Students involved in the project will find that music can be a force for good in their elementary years, as it can increase their literacy in all academic subjects. At the beginning and end of the school year, students will be assessed on their reading level. Throughout the year, students will be taught how to play instruments, write songs and will perform for the community. Through the power of music, collaboration and engagement, Cole hopes that the students will be able to increase their reading levels and create a stronger sense of self. Selected from a group of more than 1,200 applicants, Cole is one of only 100 winners across the country who received this award to help fund and bring her program to life. In addition, she will now compete with other finalists for one of the top three prizes — an additional $5,000, $10,000 or $25,000 from Voya Financial. The Building Owners & Managers Association (BOMA) has been a long supporter of Promises2Kids and foster care hits close to home for one of the BOMA Community Service Committee’s co-chairs, Dennis Dubert. Dubert, who currently resides in La Mesa, was raised in a home that served as a foster home to many of San Diego’s foster youth. His mother, Pat Dubert, who is still a foster parent, has been a selfless provider for over 45 years, fostering more than 600 children and adopting three. BOMA donated 937 backpacks, as well as lunch bags and other school supplies to Promises2Kids. BOMA has partnered with Promises2Kids for more than 25 years on the organization’s annual Back-to-School Drive and the Give From Your Heart holiday gift drive. Promises2Kids provides more than 3,300 current and former foster youth in San Diego County with the tools, opportunities and guidance they need to address the circumstances that brought them into foster care, overcome the difficulties of their past, and grow into healthy, happy and successful adults. 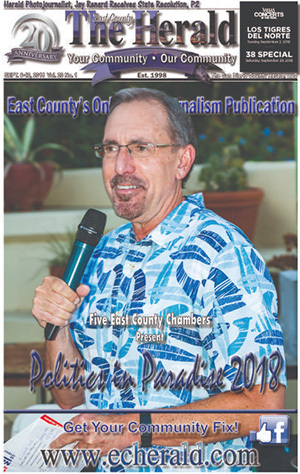 On Sept. 6, local paper The East County Herald printed its last edition. The publication, which featured mostly photojournalism of local events and people, had been in print for 20 years. In a letter to community partners, contributors and supporters of the paper, publisher Dee Dean explained that she was shuttering the popular local publication due to her ongoing battle with multiple sclerosis. “I know I should have retired a couple years ago, however, as some of you may know, I can be stubborn,” she wrote. In addition to thanking the advertisers and contributors to the paper by name, her letter touched on the uniqueness of The Herald’s approach to covering local news in the East County area. Dean also thanked the readers and fans of The Herald for “rocking her world” for 20 years. “It is my hope that you will remember The Herald fondly and smile,” she concluded.